I've talked to some of the players. Some of my good friends have already played the golf course. The golf course is in phenomenal shape. Q. Any particular holes stick out? DUSTIN JOHNSON: I mean, they're all good. They're all a little bit different. The greens have got a lot of undulation in them so you've got to be careful where you hit the ball on the green. This golf course sets up for me perfect. All the bunkers, I can fly all of them with my driver. This golf course is unbelievable. I played it yesterday. The rough is thick; the greens are perfect; the fairways are like walking on carpet. I kind of joked with my caddie yesterday when we played, I could have played the last eight holes with my shoes off. This place is very beautiful. It's a great area, and I'm excited about it. Q. Why does this suit your game, because the bunkers are not in your range? ROBERT GARRIGUS: Yeah, you know, I'm thinking about hitting driver on every hole out here, all week, just because every shot -- if I hit it in the rough, and I'm hitting a 2-iron, I'm going to have a 7- or 8-iron out of that rough. I want to have wedge out of the rough if I miss the fairway. It seems like the golf course fits my eye really well. Just every tee shot I can hit a high cut. There's a couple holes that slope left to right but I can just take it over the left side and cut it into the fairway. It seems like just every hole the bunkers aren't in play. Even on 9 there, I hit 4-iron in yesterday in the practice round over the green, and the member that drove me in, a volunteer, he's like, nobody is getting to that green. I'm like, you don't know who you're talking to. When you tell me I can't do something, I really try to do it. The golf course is very, very tough. I knew its history; I knew it hosted major championship, was supposed to host another one I think around 1990. I'm probably, even so, taken aback by its difficulty. I think it's a very tough golf course. It's tough to get the ball in the fairways. They're pitched at a lot of angles from left to right and right to left. You have to work the ball well off the tee. The greens are very big but are cut up into smaller sections. There's a lot of slope, a lot of undulation, and they're already quite firm. I think scoring is going to be very difficult. Add to that, there's probably the thickest and the longest rough we've had for a PGA TOUR event this year. So I expect scoring to be difficult. It's a tough golf course and a good test. Q. You said at the AT&T in the past that you've liked Congressional as a course. Are these similar venues in your mind, or do you prefer one or the other? JIM FURYK: We'll see. Time will tell on that one. I think that I've had a lot of success at Congressional. I've played well there in the U.S. Open, finished in the Top 5 in the couple of those. So it's very dear to my heart. My caddie is actually a member there, so it's dear to my heart. I like this golf course. I'd say Congressional probably -- I don't think this -- I like the golf course and I think it suits my game. Congressional probably suits it a touch more. But I'll be anxious to see the setup and how the golf course plays once the gun goes off tomorrow. Play well here for a couple years, and I'll like it just as much as Congressional. Q. Are you surprised at the setup, that it's this difficult? Were you looking for a little bit more of a vacation this week? JIM FURYK: No, I don't think anyone was looking for a vacation. I just had never played the golf course. I was expecting different, to be honest with you. I had a different -- I think what I imagined in my mind. I had never been here before, and I know they renovated it. I didn't see it beforehand, so now I just see what it looks like after. I just had a little different picture of the golf course in my mind. Like I said, it's still very good, I've just pictured it differently. The green complexes I had -- I didn't realize -- you think of old, something that's been here for -- I don't know when this club was started, but '20s, '28, so something that's been here for over 80 years, I don't imagine greens this size. Some of the slopes on the greens have a what I would consider somewhat modern feature to them. 17th green would be a perfect example of that. So it's just not what I pictured in my head. I knew it would be a good golf course, I knew it would be tough, and it is definitely all of both of those. It's just probably a little different style than what I had projected in my head. Q. Back to Aronimink, a course that you haven't seen before and you only have a couple days to prepare. What are the most important things to get you ready for the tournament? JIM FURYK: I think trying to figure out where the best part -- what's the fattest part of the fairway, how is the bunkering set up, where do I need to put the ball off the tee to be able to attack the green, and then the most difficult -- a golf professional figures that out in two rounds pretty easy. The difficult part of this golf course is figuring out the pin placements and the greens because there is a lot going on out there, and I think that goes along with the surprise. I didn't expect to see such big greens, I didn't expect to see them cut up into small areas like that; it's a Donald Ross course. I feel like you can go to Pinehurst No. 2, play it a couple times, and those greens are pretty easy. You aim at the center of the greens every time because you're afraid the ball is going to fall off the sides. Here there's more going on. There's a lot of slope out there. The greens are giant, and like I said, they're cut into sections and you have to figure out which pins you can attack, which ones you can't. As in any Ross course, you really don't want to go over any green; you'd rather be on the front fringe or ten yards short than probably two yards long most of the time. There's a lot of those fall-offs on the back that will leave some very difficult up-and-downs. I think learning the greens right now and pin placements and how we can attack those is probably the biggest concern for all the players. First of all, let me just thank the membership at Aronimink for not just hosting the event this week but doing such a phenomenal job to get the golf course prepared. It looks spectacular. I think it's going to play very well on the telecast this weekend all over the world. Q. Talk about the conditions of the course. NICK WATNEY: The golf course is perfect out there, and I played very, very steady. Was never really in much trouble, a lot of fairways, a lot of greens, a lot of opportunities, so definitely very pleased and looking forward to the rest of the week. Q. This course is a little bit like home in the fact that it's in the northeast, got a little bit of that flavor, old-school golf course with big trees? BRETT QUIGLEY: Definitely, big trees, big golf course, and good greens. Some undulations out there, and you've got to respect them. Q. 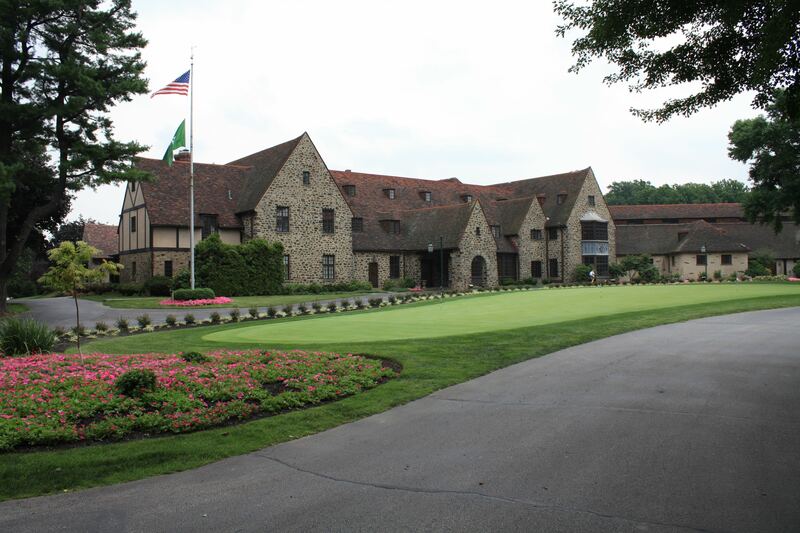 A lot of the players have heard about Aronimink, and when they got here it wasn't quite what they thought. JOE OGILVIE: Yeah, I think that's probably fair. I think that's probably fair. They've got some -- it's an old classic-style golf course, number one. Number two, you've got holes like 17 where it's not -- 17 I wouldn't consider classic. But it's not a bad hole, it's just sort of a scary hole more than anything else. Having that left part shaved, they didn't make mowers that short back in the early 1900s. It really fits my eye. I think it's a -- to me it looks like Baltusrol. I don't know if anybody else feels that way, but it looks a lot like Baltusrol, at least the last time we played the PGA Championship there. So you have a lot of wedges here. You've got your opportunities to make some birdies, but they could put the pins where -- they could put 18 pins where you just can't go for them. They could set this course up extremely difficult. Philadelphia is one of the great sports cities, so it's certainly great to be here. Merion will go over fantastic for the Open obviously, but this is fantastic. This just looks like a big event. Some golf courses look like they can hold big events. This is one of them. And I think the fans make it a big event. I'm assuming -- we don't play here obviously every year, but I'm assuming these fans are pretty educated in golf even though we don't come here year after year, so it's fun to play here. Q. You said yesterday that Congressional maybe set up a little bit better for your game. How do you feel now seeing yourself out there? How do you feel like this sets up for your game? JIM FURYK: I like the golf course. I just said that I'm cautious. I hadn't seen it yet in a golf tournament, and I've had a lot of good finishes at Congressional, so I have a lot of confidence to build on there. I'm kind of waiting to see how the week goes. I like the golf course. I'm comfortable here. It's good to be back in this neck of the woods, and I do like it. But you're also comparing it against a course that's very good, as well, one that I've played very well at for three or four different tournaments. It takes time to build a love for a golf course, I think. Q. Describe how tough this course is. CHARLIE WI: Well, when you're out there, it looks easy because you're hitting driver and maybe 9-iron or 8-iron to the green, but the greens are so fast and the pins are so tough that you have to be really patient out there. Watching it on TV, it's like, why can't they hit it close to the hole, they're 150 yards away, but the greens -- the conditions are so firm, it's really hard to get it close to the hole. Q. Talk about the greens today. JIM FURYK: I feel like it was pretty consistent. Maybe a touch quicker than they have been, maybe a touch faster, but not any firmer. I thought the course was pretty consistent with the rest of the days. I think it's been playing pretty good all week. Q. You won at Sedgefield, played well here. Anything about old Donald Ross designs that you like? RYAN MOORE: You know, I have no idea why I play well on his golf courses. You know, they seem to be fairly demanding off the tee, generous but demanding. They're not tiny little fairways, but they're sloped and they kick and bounce and can run through pretty easily. And I think I'm one of the top couple people in all-around driving for the year. So I've been driving the ball really well this year, actually getting a little bit of my distance back, but the accuracy has still been there. I think first and foremost you really have to do that on his golf courses because the greens are so tough. If you're in the rough all day long, you're just hitting it to 30 or 40 feet on the green, and there's no such thing as an easy 30-footer, especially on Donald Ross greens. Q. You're a little bit of a historian of the game and sort of pay homage to some of the history of the game, the way you dress and things like that. Thoughts on just an old classic course like this and other classic courses? Do you prefer these sort of setups because you guys don't play them very often? RYAN MOORE: I love them. I wish we could be on one or two more of these a year. I think they're just great golf courses. I love just how the older architecture really built the golf course into the land. They couldn't move dirt that much, so they had to really put the golf course where things should be put. Any more we can move stuff around so much, we can just manipulate it and turn it into whatever we want. I think that's so brilliant about some of these courses, Tillinghast courses and Donald Ross courses, the way the course fits to the property and the land, I just love it personally, and I think they're so much more intelligently designed just because they had to be much more intelligently designed. We can do whatever we want anymore, so we probably don't have to think about it quite as much. But they're just -- him and Tillinghast are probably a couple of my favorites, and they're just demanding golf courses, but they're right there in front of you. They're not tricky or anything like that. They give you a spot to hit it, and if not, you're going to pay the price, and I like that kind of golf.